They Don’t Want to Be Owners! In our ongoing series about bridging the gap between management and emerging leaders, we would be remiss in not addressing the topic of moving from emerging leader to owner. The perception among many in our profession is that there are fewer individuals at the senior and manager levels who aspire to be an owner and, even when they show a desire, they simply do not seem technically capable. I can find no statistical data that proves this perception but when I ask current partners how many of their own peers actually became owners, the number is low. That indicates to me that there have always been a low number of people entering our profession that ultimately aspire to climb to the partner level. A more definitive fact is that there are certainly less overall members of the workforce now than in the past. 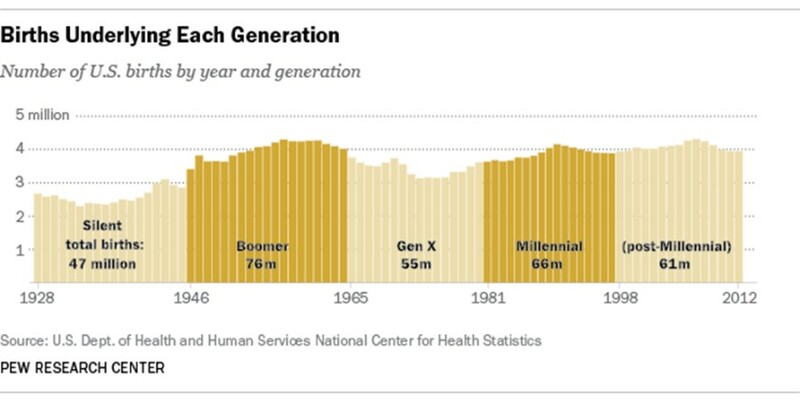 Notice in the graph below that the decline in Gen X births means there are fewer bodies from that generation to replace Boomers as they retire. Therefore Millennials are in a unique position to move to leadership positions – even ownership positions – sooner than we have seen in the past. Given the reality of so many current leaders leaving our profession and the need to find new leaders who will take over the reins, I asked Dennis Sherrin, Managing Partner of Hartman Blackmon and Kilgore, PC, who has been a partner in his firm for 30 years, and Rachel Godwin, a new Principal at the firm, for their perspective on ownership of firms then – and now. When did you determine you wanted to become a partner, and what was the motivation? Thinking back 30 years ago to reflect on the reasons I wanted to be a partner might test my memory! I went into the profession when most firms operated under an “up or out” premise. As I began my career, I contemplated where my ambition might take me. If I stayed in public practice, I wanted to reach the level of “Owner.” After only a few years in the profession, I was confident I would remain and my goal was unwavering to become a partner. The “why” at that time would have to have been prestige, managing clients, and being a boss. I have spent my entire professional career with HB&K. I joined the firm in November 2001, fresh out of the University of West Florida with my bachelor’s degree. I am actually the first person to have started with the firm as a staff accountant to be promoted through to principal. I was promoted to Principal in January 2014. In the beginning, I began to take on more leadership roles such as being on various committees, helping lead the audit department, and helping lead the Brewton Office. I liked having a role in helping shape the future of our firm and assisting in the development of the various projects we had undertaken. It created a sense of investment on my part to see the outcome take place. This led to me wanting to be able to continue to provide a positive contribution to the firm’s future in the role of a Partner. He started young and leadership was about power, client work and being in charge. It is about trust from current leaders, opportunity and being given the chance to lead before ownership is obtained. What were the primary expectations of a partner when you began your journey? Through circumstances and opportunity, I became a partner before I turned 30. The CPA firm was small and the partners were focused on production rather than business growth, personal development and planning for the future. The first few years as a partner were some of the most demanding in my career in terms of time devoted to producing billable work. That work was often compliance level with very little advisory even discussed. In spite of being buried in the compliance work, the 1990s were very good for us in terms of growth. The prosperity of the 1990s made growth look easy. By the early 21st century we had more than doubled in staff and revenues. Still we lacked a true sense of operating as a business and lacked a set of forward looking objectives. Those objectives began to develop in 2008. My current role with the firm is the Director of Accounting and Audit Services so I help lead that department. I am involved in various firm committees and serve as the current chair of the Technology Committee. All employees have Balanced Scorecard Goal Plans for which we have goals in 4 categories: Financial, Client Satisfaction, Training & Learning, and Internal Processes. I help in leading the Brewton office for the firm. I work with the Shareholder team to develop and implement the strategic plan for the firm as well as assisting with other firm decisions. The billable hour was key and compliance work was king but even current leaders recognize that is not a long term viable strategy. The balanced scorecard with financial, client satisfaction, training and processes are all equally weighted in goal setting at the leadership level. Why would you encourage new leaders to make “owner” a career aspiration today? Prestige is now pride. I am proud to be a part of a firm that works to improve every day and cares for its employees first. Rather than use the word “boss”, I prefer “leader” for what I do daily. It is my mission to empower our employees to do great things and reach for more than they think they can while making sure they get the credit and this firm prospers. My “why” comes down to I love looking to the future and planning for what comes next, as well as helping others develop into great professionals and leaders in their own right. So, do I think being a partner is awesome, today? Absolutely, it is awesome to be a partner. I know my journey has led me to make every effort to better share my knowledge and experience to help others learn what took me many years of hard knocks. The reasons being a partner is awesome today differ from my view 24 years ago. As I learned who I was and why I was in certain roles, I realized I wanted to help people achieve what they are striving to achieve. I had to learn that through many years of demanding effort, stress, challenges and opportunity. I now look forward to tomorrow, everyday. I would encourage other emerging leaders to take on the challenge because I think it is a very exciting time to be in the public accounting profession. There is a lot of change occurring in various forms such as technology, partner retirement and transition, etc., but I believe those changes are creating great opportunities for those emerging leaders who want to step up to the plate. By taking on more leadership roles within their firms, emerging leaders have the opportunity to help define the future of those firms and create the culture they want. Leadership is the key and putting employees, innovation and relationships first is the key. Define your own future or someone else will define it for you!